Trying to silence ex-Ill. Gov. Rod Blagojevich is almost as challenging as capping the oil spill in the Gulf. Still, U.S. District Judge James Zagel, who is presiding over Blagojevich’s public corruption trial in Chicago, thought he’d try to slow the word spillage a little. 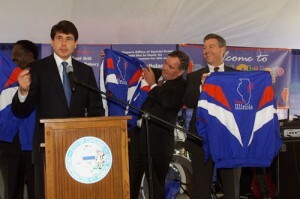 Just before opening statements on Tuesday, Zagel banned Blagojevich from tweeting from the courtroom, according to the Chicago Tribune. Blagojevich, who seems to have a love with cameras and microphones, can still talk with the media outside of court, the Trib reported. But the judge warned Blagojevich that his “repeated public statements” could be used against him if he testifies during the trial, the paper reported. Posted: 6/8/10 at 6:17 PM under FBI, News Story.